TEIXEIRA R & SURMINSKI P (2018) Calls of Tawny Owls Strix aluco provide insight in census criteria. LIMOSA 91 (3): 123-127. In 2017 a pair of Tawny Owls was breeding in our garden at Wouwbaan 172, Hoogerheide. They raised four chicks to independence. Since we could hear the birds often even inside the house, we had the opportunity to get familiar with many of their calls and assess seasonal patterns in calling behaviour. Calling behaviour of adults peaked in autumn and winter, whereas juveniles were mainly heard in March-May (which is relatively early compared to other studies probably as a result of an early timing of breeding due to high food abundance). 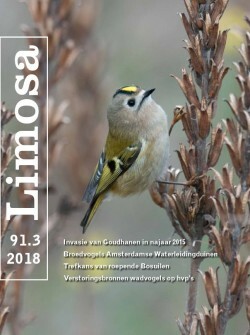 Observations (mainly calls) as archived on public birdwatching sites (Waarneming. nl) in the community of Bergen op Zoom showed a very different seasonal pattern: most Tawny Owls were recorded in April-July, which mainly seems to reflect the activity of the birdwatchers. The breeding bird census (BMP) guidelines of Sovon state that the best time for a bird census is when the observation probability of a species is at its maximum. For the Tawny Owl it is recommended to survey in January-July. However, based on our study, the chance to hear an adult during this period is lowest. Especially unsuccessful pairs and pairs that do not breed will easily be missed. Population estimates based on the current guidelines likely result in an underestimate of the population size. To arrive at a more realistic estimate, it is advised to expand the survey to the rest of the year.